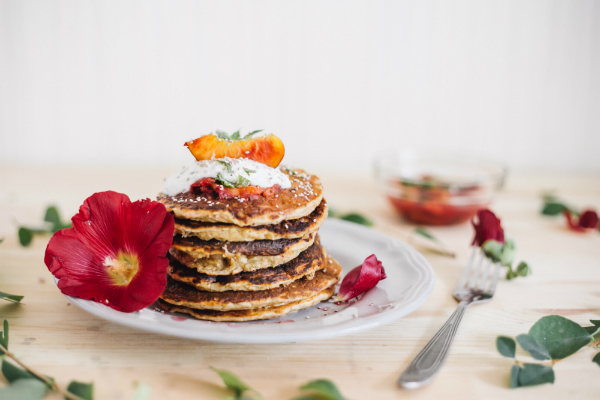 These Carrot Cake Pancakes (with spiced cream cheese) are a delicious twist on regular pancakes and a great way to include vegetables in your breakfast or a fun school holiday morning tea. WATCH OUT – the Easter Bunny might nick one! Finely grate carrot so it can cook through (otherwise it will be crunchy). Add the flour, spices, bicarb, baking powder, salt and sugar. Mix to combine. Now add the egg, vanilla, yoghurt and milk and mix to just combined. Cook in a little butter, ghee or coconut oil in a hot pan, but turn it down to a low to medium heat flipping once the mixture bubbles. Try not to cook to fast (on a high heat) as you want to give the carrot a little time to cook. To make the spiced cream cheese simply mix all the ingredients together.